People come up with all sorts of reasons for why they don’t need a will – I’m young and healthy, I don’t own that much stuff, everything would go to my spouse and that’s fine – but in reality, none of these excuses carry much weight. The truth is that unless you are happy with how your property would be distributed under the intestacy framework set up by the state, you do need a will. Young and healthy doesn’t mean invincible, you probably have more than you think, and the only way to truly manage where your property goes is with a will. Believe it or not, you already have a will! The “default will” for residents of North Carolina is made up of the state’s laws of intestate succession. If you die without a will of your own, these laws determine what happens to your property that is subject to probate (also called the “estate”). Many people assume that without a will, all of their property will go to their spouse – not so! If you are also survived by a parent, child, or grandchild, they may be entitled to part of your estate under the intestacy laws. If you are unmarried or your spouse dies before you, some or all of your estate might go to your children, parents, siblings, nieces and nephews, grandparents, or aunts and uncles. When considering whether you are comfortable with allowing your estate to pass under intestate succession, it is important to examine all of the possible outcomes. Even if you are comfortable with how your property would be distributed under intestate succession in your current situation, would you still be comfortable if your situation changes? How would the distribution of your property be changed by a marriage, divorce, birth, or death — and are you still comfortable with that outcome? 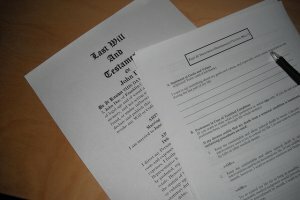 What can I accomplish by writing a will? The purpose of writing a will is so that you can decide what happens to your property after your death, not the government. Writing a will offers the opportunity for you to make specific bequests. Perhaps you want to leave an item of sentimental value to a particular person or you know that one of your children needs more help that the others – a will allows you to make those decisions. Another benefit of a will is that it allows you to better provide for minor children. Writing a will enables you to place assets into a trust for minor children so that your assets can provide for children, but they are unable to directly reach the assets until a set age. You can also decide who would take care of your minor children by naming a guardian for them. When you write your will you also appoint an executor to oversee the distribution of your estate. If you die without a will, the court appoints someone to handle the estate. By naming an executor, you can ensure that someone you trust will be managing your affairs. There are many other benefits to writing a will, such as the opportunity to minimize the estate tax burden in certain cases. You should contact a lawyer to determine how a will could best benefit you. Yes, if you want it done right the first time! We understand that people want to save money by writing a will on their own or using an online program to do it for them. However, these “do-it-yourself” wills often cause problems that require more time and money to fix than a visit with a lawyer would have. Companies that provide “do-it-yourself” legal services cannot provide you with the personal attention of an attorney. These companies often do not keep up with changes in the law in every jurisdiction. They do not review your documents to ensure that they are internally consistent and that everything has been properly phrased so that a court will carry out your wishes. They cannot make suggestions of non-legal steps you might take or alternative ways to develop your estate plan. In other words, a “fill-in-the-blank” will is only as good as the person filling in the blanks. LegalZoom, one of the most popular “do-it-yourself” legal service providers, once estimated that “80% of people who fill in blank forms to create legal forms do so incorrectly.” When these defective wills are submitted to probate, they often cause confusion and fighting amongst families and may even be outright rejected by the court. A rejected will lands you back at square one – intestate succession. Ensuring a simple, straightforward estate administration. Once you have decided where you want your property to go, next you should to determine what you actually own. Make a list of what you own, how you own it (for example, if you own your home or car jointly with your spouse), and where it is located. Though some of your assets will pass outside of your will, it is good to know exactly what you have in order to ensure a fair distribution. Finally, you should find an attorney to help you with the will drafting and execution. The attorney may also suggest other important estate planning documents, such as a power of attorney, healthcare power of attorney, living will, or living trust, as appropriate.